One of the roses is flowering and half a dozen of the others have burgeoning buds that will soon open and release their exquisite fragrance; sadly, if this strong north-easterly wind does not stop blowing, nobody will be able to smell it although the residents of the neighbouring village might just catch a whiff as it hurtles past. 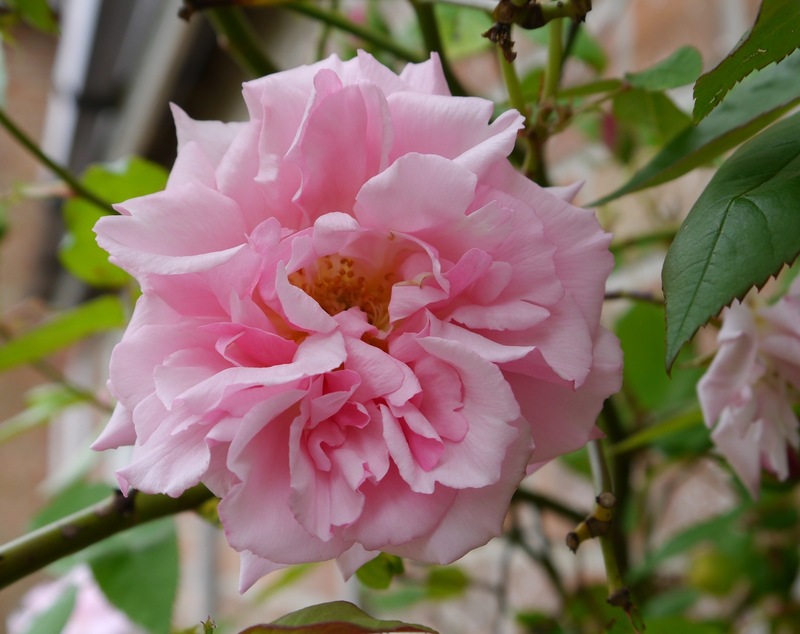 Many people who are avid readers of whodunits but not particularly keen gardeners will still know about the thornless climbing rose “Zephirine Drouhin” which appears in Agatha Christie’s story “Sad Cypress.” The photograph I took today shows a sport of that variety, also thornless, called “Kathleen Harrop” but this one is much less well known. It grows against a wall of our house and I have used it in my manuscript as a clue for Ellie.